Step 3.: Fill in your personal information and pay online. 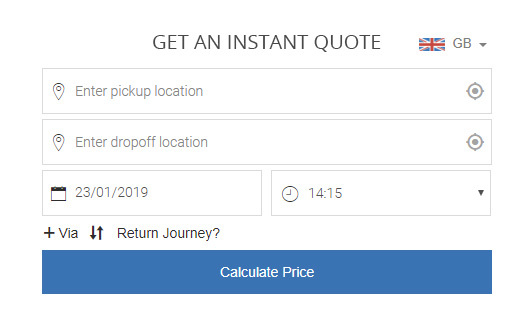 The company’s homepage will feature a quick quote widget where clients enter the most vital information (the departure and arrival postcode) to instantly get a precise cost estimate. Just choose locations in the From and To, plus the Date and Time and the quote is there. Pickup Airport, Address or Postcode – here the customers choose their desired pickup location. While typing an address, the system will make automatic suggestion of full addresses (our system is powered by Google Maps) or put forward one of the Locations defined by the admin. Drop-off Airport, Address or Postcode – in this field the customers decide what their drop-off location is. While typing an address, the system will make automatic suggestion of full addresses (our system is powered by Google Maps) or put forward one of the Locations defined by the admin. Date & Time – the customer chooses a convenient date and time for his journey. + Via – allows customers to add any additional stops along the way to drop-off point. Return Journey – allows the customers to book a return travel. A new pop-up window appears where customers enter return journey details (pickup and drop-off points and the journey date). 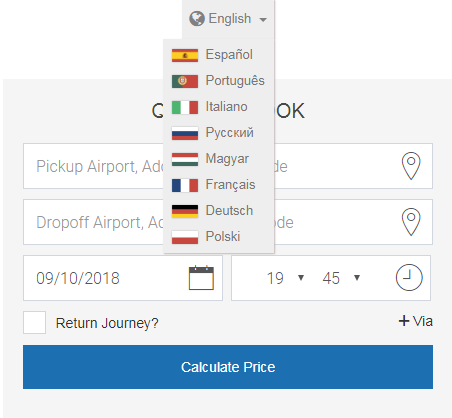 Calculate price – after entering all the needed information, the system automatically calculates the price of that journey. This will also forward you to step two of the booking process, Choosing a Car. The customer can easily change the Web Booking form language version. The available languages are: English, Spanish, Portuguese, Italian, Russian, Hungarian, French, German and Polish. Dutch will be joining them shortly. If you would like to see another language added to our system, please feel free to contact us HERE. In this step the customer can choose a desired vehicle from the list. The sets of vehicles for each company can by added and edited at any time by the admin. Price – the journey cost is generated based on the price matrix. The admin has full access to set prices which fit the company’s profile and current needs. Learn more about our prices HERE. Choose a car – customer chooses his vehicle by ticking one of the blue boxes on the right. 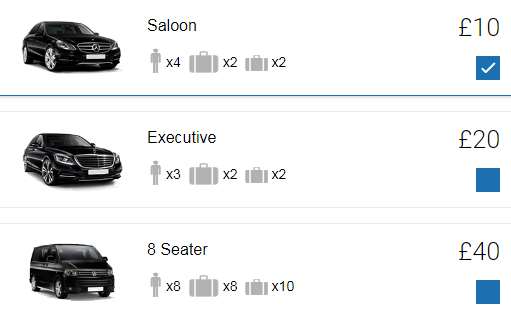 Passenger and luggage capacity Icons – show the maximum capacity for each car. The admin can edit these settings for each vehicle separately. Book Now button – allows the customer to move onto the final booking step, Complete Booking and Pay, where the client enters his personal information first and other travel details (other passengers, luggage) and then pays for his journey. Meet and greet – the customer needs to tick the right box to order an additional service and have the driver greet him at the pick-up location. Change the language (top-right menu) – change the language version without having to go back to Step 1. Edit the route (left top corner) – allows the customer to go back to the Quote&Book and edit the journey’s route. Map – shows the chosen route, distance and approximate time of arrival. 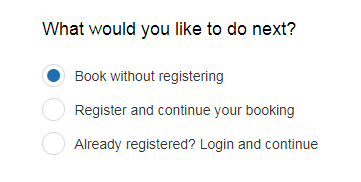 Finalise the booking with or without registering – in this section the customer can choose to proceed in one of three ways. Register and continue your booking – the customer creates an account which he will also use for future bookings. This will make it easier and quicker for them to book upcoming journeys. A history of their bookings from this account will also be kept from now on. Already registered? – the customer can login to use an already existing account to finalise his booking. Your Details section – the place to enter personal data by the clients and also details like the number of people travelling with them or their luggage count. 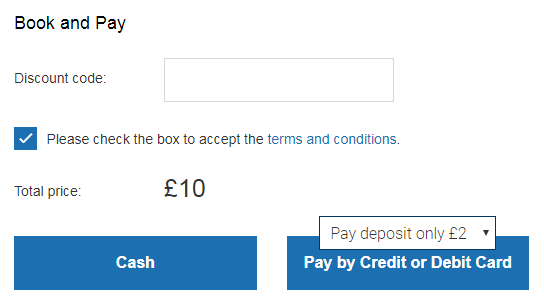 Book and Pay section – here the client confirms the booking and chooses a payment method. Discount code – if the customer has a discount code, the system will automatically change the journey’s price. Terms and conditions – customers must tick the blue box to confirm that they have accepted the terms and conditions of the booking. Payment method – customers can choose a desired payment method from the right blue box (cash, credit card or debit card). Confirm the booking – after successfully completing the booking process, customers receive a (an email) confirmation with their own reservation number and a confirmation of their payment.